Square Enix's Play Arts Kai line has produced some fascinating pieces from various game series like Metal Gear Solid and of course SE's own Final Fantasy. Not braking for anyone, the company is marching right along with a fresh batch of hot buns straight from the oven. 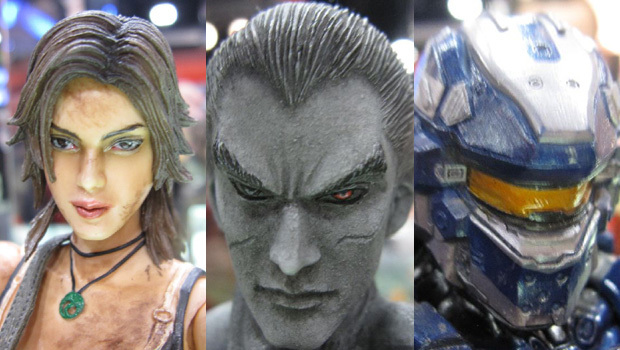 During SDCC, Square Enix showed off some unpainted models of Kazuya Mishima and Jun Kazama from Tekken as well as a different version of Master Chief from Halo. On the painted front, there are figures of Lara Croft from the Tomb Raider reboot, Agent 47 from Hitman, and a blue Spartan soldier again from Halo. Maybe it's because extreme photographic close-ups have a nasty habit of revealing otherwise unnoticeable blemishes, but I think the painted figures look rather shabby. The ones without paint, on the other hand, have a definition about them that simply looks more appealing. Agree?